THE bride was radiant, and the groom, dashing. It was a sweet and touching ceremony. We wish the couple all the best as they embark on a new chapter in their lives. 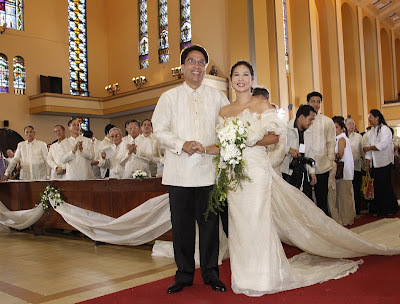 Here are some photos from Tuesday's wedding of Sen. Mar Roxas and broadcaster Korina Sanchez at the Sto. Domingo Church, courtesy of the senator's office. Enjoy! 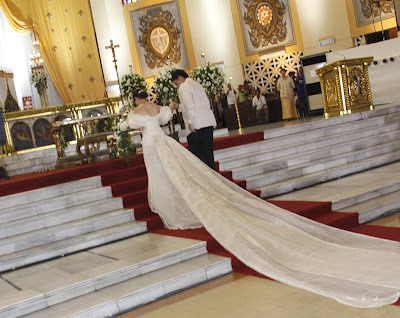 Mar helps his bride-to-be to the altar as the wedding ceremony begins. Mar looks totally enamored with Korina. 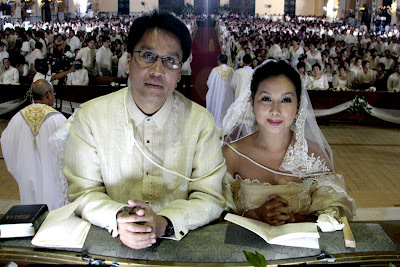 With the conclusion of the matrimonial rites, Mar and Korina kiss for the first time as husband and wife. Indeed, dreams can come true, as Korina said in her vows. Mar: 'I give myself to you as your best friend, to applaud when you succeed and encourage when you stumble. I offer myself to you as your husband in respect and in trust. Korina: 'Dumaan man ang unos, mga pagsubok, ang sakit, ang kabiguan, ako ay mananatiling dikit sa iyong dibdib kahawak ng mahigpit ang iyong mga kamay.'. 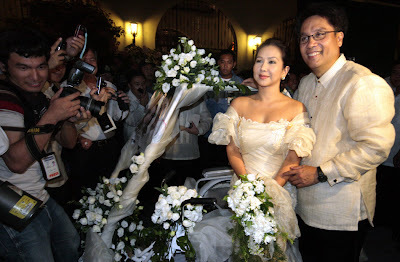 Mar and Korina by their 'Bridal Traysikad' outside the church, after their wedding rites.